Cell phones are a ubiquitous part of our society today. For the first time last year, more Canadians owned mobile devices than landlines, thanks to their increasing functionality. As a result, it may not come as a shock that many businesses have begun the switch to mobile devices for their workplace communication. But is that really the best choice? New technology is not always better, particularly when you need the technology to perform very specific tasks. Even today, two way radios continue to be popular for many businesses, thanks to the many advantages they offer. Here are five benefits of these radios vs. cellular for business use. Every cellular user knows about the perils of signal loss. Regardless of carrier, a simple step into the wrong zone can lead to a complete and annoying lack of ability to communicate. For businesses, that problem becomes magnified. Communication may be necessary to complete your job, particularly if you are at a worksite, to communicate with your team. 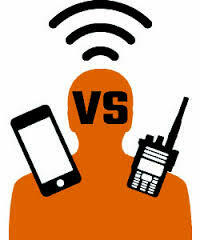 Two way radio systems provide instant localized coverage that is not limited by your surroundings or cell towers. The radio’s signal capabilities add to its reliability, but that’s far from the only advantage of these Motorola products. In fact, two way radios have longer-lasting batteries than cell phones, allowing for less time-sensitive communication throughout the day. In addition, Motorola two way radios come with noise canceling technology that enables you to concentrate on the communication instead of your surroundings. With the single touch of a button, you get a reliable radio connection that helps you focus on the task at hand. Especially on outdoor worksites, durability is key. You don’t want to drop your cell phone, as it’s not meant to withstand that impact. Two way radios are built for these environments, and are able to handle the everyday wear and tear that come with even the most rugged construction sites. Stop worrying about constantly having to replace your workers’ devices, and go with two way radios instead. The last thing you want is for your business to be non-compliant with local laws. A number of jurisdictions across Canada have enacted distracted driving laws, which limits the use of hands-free devices while on the road. Particularly if your business includes driving equipment or transport vehicles, cell phone use is limited. You might not know that some two way radios do not fall within that category. In most of these jurisdictions, you can use radios while behind the wheel, meaning you can continue to communicate while ensuring safety precautions for both your company and your employees. Even if all of the above points do not convince you to go with two way radios, consider this question: how often do you have to communicate with more than one worker at a time? Ultimately, phones are limited to single, one-to-one communication structures. That’s great when you never have to involve groups, but particularly on larger construction sites and operations, it’s simply not enough. Enter Motorola two way radios, which are not limited by a single sender and receiver. Communicate with your entire team, without having to worry that one of them misses the memo. Thanks to this increased reach, you can successfully perform team business operations. While countless businesses take advantage of mobile phones for their workplace communication, two way radio systems continue to be at the forefront of wireless business communication thanks to these five benefits. Their signal capabilities, reliability, durability, compliance with laws and reach make them valuable assets for your business. Contact Nova Communications for more information on how a Motorola two way radio system can work for you and your business.